Chili cook-offs, chili contests, chili exhibitions: let’s face it – America is smitten with this piquant dish, and for good reason! It is rich, complex and as varied any dish can be – from a mouth-scorching chili made with fiery habaneros, to the fragrantly spiced Asian chili I am presenting here. One thing they all have in common? Every cook is fiercely proud and sometimes secretive of his or her own recipe. I was recently a judge for the annual chili competition at the school I work in. As I sampled spoon after spoon of the 15 or so different chilis, I marveled at how distinct each one was. 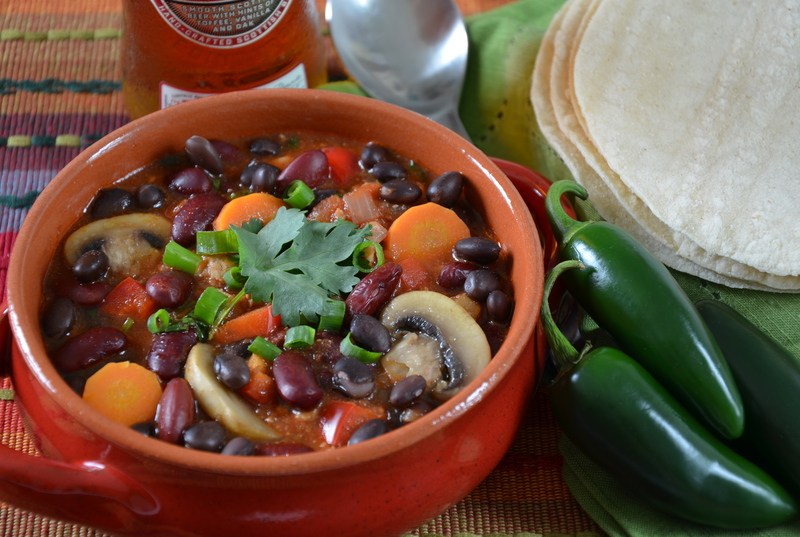 I am sure that the vast number of chili recipes from around the continent could fill tomes! So, here is my contribution to that imaginary tome. I have experimented with diverse chili recipes over the years and have arrived at this one, my absolute favourite (and I’m not keeping it a secret!) As you already know, my penchant is for Asian flavours; and because there are no rules, here is Asian Style Turkey Chili. I hope you enjoy it! I have, on occasion, made a vegetarian option. You can simply eliminate the ground turkey and add cooked quinoa or a can of chickpeas. Just experiment to discover which is more pleasing to your palate! Heat oil in a large, heavy bottomed soup pot. Add onion and sauté until soft. Add ginger and garlic and cook until fragrant . Add red pepper, mushrooms, and carrots and cook until they begin to soften. Add ground turkey and cook until it is no longer pink. Add chili paste or jalapeño pepper, cumin, chili powder and allow the flavours to gently release. Add tomatoes and beans. Bring to a boil. Reduce heat and simmer gently for 30 to 40 minutes, until the carrots are soft. Stir in soy sauce, rice wine vinegar, and sesame oil and simmer gently for 15 or 20 minutes. Stir in cilantro and season with salt to taste. Garnish with cilantro, green onion and jack cheese. Serve up with warm, buttered tortillas or a good crusty bread and butter. This chilli is incredible! It’s so satisfying and tasty. I love it!